'Doctor Who' returned with the relatively strong 'The Bells Of Saint John' last time out but my faith in the current series has reached its lowest point with the immensely disappointing latest episode, 'The Rings Of Akhaten'. Although it actually started off quite promisingly. Spoilers for 'The Rings Of Akhaten' below. The previous episode had ended with a befuddling Clara (Jenna Louise Coleman) quote: "That wasn't a leaf, that was page one." Perhaps surprisingly, this was picked up immediately in 'The Rings Of Akhaten' as we discovered that the leaf brought Clara's parents together. It also transpired that Clara's mum died as she was growing up - an event that I suspect will come up again, perhaps in a 'Quantum Leap'-style episode. Anyway, Clara decided to join The Doctor (Matt Smith) and their first trip together was to the Rings of Akhaten, where peril not only befell the duo but the vast array of aliens gathered. Not that they ever seemed to be of any concern. Nor did they really help. They were just sort of....there, with an underlying reminiscence of the cantina from 'Star Wars'. One alien who played a more prominent role was Merry Gejelh (Emilia Jones), whose error jeopardised everyone's lives, and whose whining was increasingly annoying as the episode progressed. Thankfully, children aren't all like this. (What hell that would be.) Perhaps I'm being overly harsh but this character, in particular, made it difficult for me to enjoy 'The Rings Of Akhaten'. Similarly, The Doctor ranting away at a green screen (villain) did little to excite me. I'm surprised that writer Neil Cross nor director Farren Blackburn had learnt from the mistakes of the 'Fantastic Four: Rise Of The Silver Surfer' or 'Green Lantern' films, which were poorly received partly thanks to the difficulty of using a faceless antagonist. Blackburn's insistence on having his actors DRAMATICALLY TURN AROUND was equally frustrating. 'The Rings Of Akhaten' is quite possibly the worst 'Doctor Who' episode that I've ever seen, certainly linked to Smith's weakest performance yet. Its ending, which brought the leaf suitably back into the storyline, somewhat rescued the disaster but I found myself struggling to care for much of the episode. And about the rest of the series. Hopefully next week's 'Cold War' will reignite my interest. 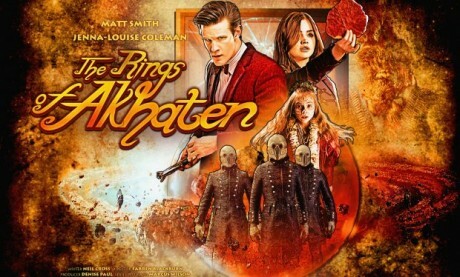 Watch 'The Rings Of Akhaten' on BBC iPlayer for a limited time.